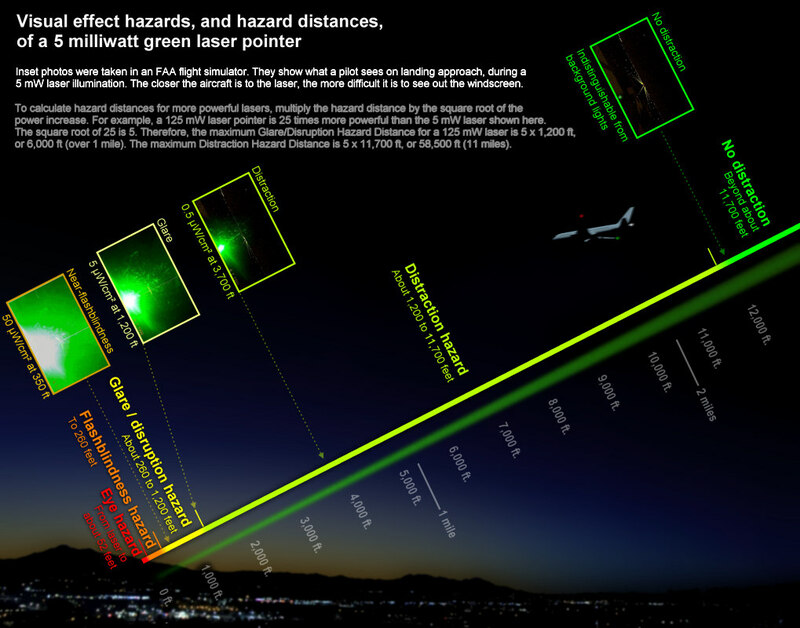 The primary hazard is visible-light lasers aimed at aircraft that results in “visual interference” with pilot performance, during critical phases of flight such as takeoff, landing, emergency maneuvers, and low-altitude flight (helicopters). Experts have identified three main visual interference hazards: 1) temporary flashblindness, 2) glare and disruption, and 3) distraction. Temporary flashblindness. Like having a camera flash directly in one’s eyes — the pilot is temporarily unable to see until the afterimage fades. Distraction. The pilot is distracted by steady or flashing laser light that is significantly brighter than other nighttime sources such as city lights and airport marker lights. While not technically a “visual” interference — the pilot can see despite the light — the light distraction can interfere with mental awareness. This can be overcome by education and training in laser hazards and how to react to them. Visual interference is hazardous during critical phases of flight -- landings, takeoffs and emergency maneuvers. If pilots are illuminated at cruising altitude, there is usually plenty of time and altitude to recover even from flashblindness. But when a pilot is flashblinded on final approach, the situation can be very dangerous. This is especially hazardous because even a low-powered “legal” laser pointer (5 milliwatts power, 1 milliradian divergence, green color) can be a distraction at a distance of two miles. Obviously, more powerful lasers are of even greater concern. The most severe impact on flights thus far have been a 2016 Virgin Atlantic flight which was aborted after an hour, and numerous police and rescue missions which were cut short. However, one can imagine a scenario where laser interference with flight operations happens at a critical time, and becomes the proverbial “straw that breaks the camel’s back,” causing a serious accident. FAA public domain photo illustrating what laser illumination of a cockpit can look like. Because the beam usually cannot be held steady on the cockpit, pilots experience one or more flashes as the beam crosses the windscreen. An animation on this page illustrates the effect. The FAA’s highest-resolution version of the above photo is here. Visual interference happens only when the laser emits visible light. Also, because the eye is more sensitive to green light, a laser emitting green light will cause more visual interference than a laser of equal power emitting a red or blue beam. This and other basic principles of laser hazards are discussed on this page. The secondary hazard is the potential for a laser to cause eye effects or injuries to pilots (or anyone onboard looking out a window towards strong laser light). There have been documented eye effects such as watering eyes; these occur in less than 1% of reported laser illuminations of aircraft. However, pilot exposure in flight to laser light is highly unlikely to result in significant or permanent eye injury. In fact, as of February 2019, there have been no documented or proven cases of permanent eye injury to pilots, according to aviation agencies such as the U.S. FAA, U.K. CAA, and Transport Canada. Fortunately, it is very unlikely for pilots to incur eye injuries from consumer-type lasers aimed at their aircraft, or even from more powerful light show lasers. Of the tens of thousands of reported laser/aircraft incidents, only in less than 1% of cases have there been reported laser eye injuries (adverse changes to the retina) and eye effects (watering eyes, pain that dissipates). Reports of corneal injury are not from the laser light itself. It is because the person rubbed their eye too hard after the laser exposure. Visible laser light travels through the clear cornea (at the eye’s surface) and does not interact or change it. But rubbing too hard can cause painful corneal abrasions which usually clear up within three days. Detailed statistics on FAA-reported laser eye effects and injuries are here. Many or most injury reports are questioned by recognized laser safety experts. For example, the injuries could have been pre-existing or could have been caused by non-laser factors such as rubbing the eye after an exposure. In a very few cases, minor injuries have healed — just as skin heals after a small cut or burn — with no ill effect on vision. As for permanent eye injuries, these appear to be non-existent. 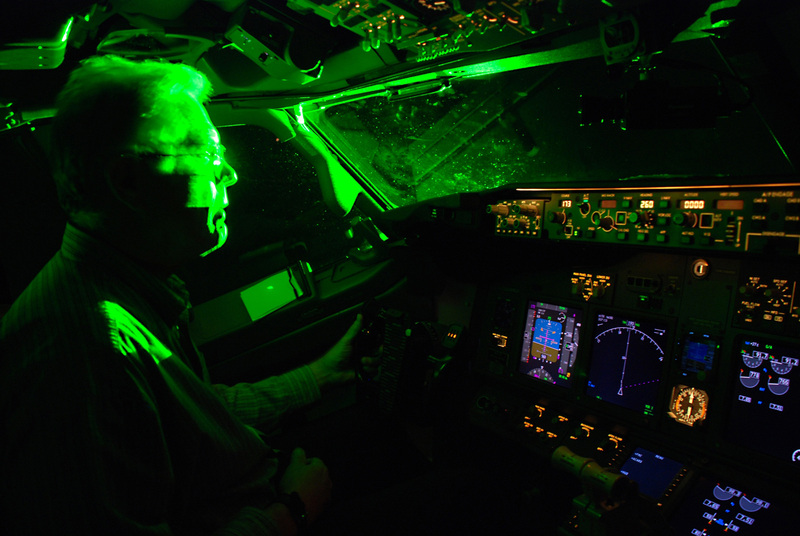 A 2016 in-depth study by three top U.K. laser safety experts concluded that lasers aimed at aircraft have not caused permanent eye injuries, and are not likely to do so. Similarly, on July 26 2017 a Transport Canada spokesperson told LaserPointerSafety that “Transport Canada is not aware of any cases where a pilot suffered permanent eye damage as the result of a laser strike." There was one report in the U.K. of a pilot who claimed to be injured, but experts doubt his eye troubles were due to laser exposure. Eye injury could occur from any type of laser beam, visible or non-visible (infrared, ultraviolet), that is powerful enough to harm eye structures. This is unlike visual interference, which can only be caused by visible light. Safety experts do not believe there is any problem from non-visible laser beams being pointed at pilots; they have not seen any evidence on the ground or in the air. There are a number of reasons why pilots have not had documented permanent or serious eye injuries, even when Class 4 lasers have been deliberately directed at them. Beam divergence. The distance from laser source to a helicopter or aircraft cockpit can be hundreds of thousands of feet. This gives the beam room to spread, so that only a fraction of the total beam area goes through the (nominal) 7mm aperture of an eye’s pupil. For example, a Class 4 beam of 500 mW, 1 mrad at a distance of 500 feet spreads out to ½ foot across and has an irradiance just below the Maximum Permissible Exposure for a 0.25 second unwanted exposure time. In other words, the beam is considered unlikely to cause injury to a person who is not deliberately staring into the light. The diagram below illustrates how beam divergence reduces the power that goes into a person’s pupil. Additional safety reduction factor. Without going into too much detail, the Maximum Permissible Exposure and the related Nominal Ocular Hazard Distance contain a safety or “reduction” factor. If a laser has a NOHD of 500 feet, at about 1/3 of that distance (167 feet) is the point at which there is a 50/50 chance of an exposure under laboratory conditions of causing the smallest medically detectable eye injury. This means that even a nominally hazardous exposure (within the NOHD) could result in minimal or no change to the retina. For more information on this, see the page Laser hazard distance equations and scroll down to the section on ED50 distances. Relative movement. It is difficult to keep a handheld laser’s beam steady on a target that is hundreds or thousands of feet away. In most laser/aircraft incidents the beam is flashed briefly, one or more times, at the pilot’s eyes. These short flashes give the retina time to cool down, thus reducing the injury risk. Also, the aircraft often is in motion – hovering helicopters excepted – also increasing the difficulty of keeping a beam on a target. Windscreens spread the light. Aircraft windscreens often have scratches or other imperfections which scatter and/or refract the light. This is detrimental from a visual interference standpoint, as it can spread the laser light so it blocks the entire windscreen. But from an eye safety standpoint, spreading the light also reduces the irradiance. Pilot actions (aversion effect). A person unexpectedly exposed to very bright light will reflexively blink, turn, move out of the light or take other evasive actions. Laser safety standards take this into account. For example, many laser standards are based on a person not being exposed to visible laser light for more than 0.25 second; it is assumed the aversion response limits the exposure time. This may or may not be completely true but the general principle of a person being safer if they turn away is a factor in helping reduce pilots’ exposure time. There are three well-publicized cases where pilots claimed serious or permanent eye injuries due to laser exposure during flight. However, in all three cases it seems that laser light did not cause the eye injuries or effects that were claimed. The cases are discussed below. Glendale (CA) police sergeant Steve Robertson said that in the mid-1990s his corneas were severely burned when his police helicopter was flashed with green laser light. He said he was momentarily incapacitated and would have crashed if his co-pilot had not been able to land the aircraft. He was taken to a nearby hospital “where doctors scraped his corneas.” He returned to work four days later and still had 20/20 vision as of 2010. The idea of visible lasers causing a corneal burn is highly suspect. This is because visible laser light goes through the transparent cornea and is not absorbed to any appreciable extent. If the visible light was strong enough to damage the cornea, it certainly would have caused extensive retinal injuries as well. In some cases, a pilot will vigorously rub his or her eyes, causing painful corneal abrasions. As discussed earlier, while due to a laser light illumination incident, this was not directly caused by the light itself. Finally, this incident is unusual because in the mid-1990s, there were no powerful handheld green lasers. Such a laser would have been large, heavy and expensive. The source could be from a laser light show – which would have been relatively easy for law enforcement to locate – or perhaps from someone misusing an industrial laser by aiming its beam outside, then reflecting it up into the air. U.S. Navy Lieutenant Jack Daly claimed to have been injured on April 4, 1997 by a red laser aimed at him as he was in a Canadian Armed Forces helicopter photographing a suspected Russian spy ship, the Kapitan Man, on the U.S. side of the Strait of Juan de Fuca. He suffered intense pain in his right eye. A retinal specialist found three tiny retinal pigment defects in one eye and attributed it to the laser. There are many interesting aspects to this long-lasting case, including a Coast Guard search of the ship, Daly’s appearance before a Congressional committee, his lawsuit against the shipping company, and a request – turned down – for a Purple Heart. As part of these events, he had many additional medical exams over the years. More information and links are here. In spring 2015, an unnamed pilot in a British Airways plane landing at Heathrow Airport was illuminated by what was assumed to be a “military-strength” laser, according to the general secretary of the British Air Line Pilot’s Association (BALPA). The man was treated at a Sheffield hospital for a burned retina in one eye, and has not worked since the incident. The incident was first publicly revealed by BALPA in a November 2015 press release. In April 2016, the case was discussed in an editorial written by three leading U.K. laser safety experts — including the laser safety regulator who was a co-author of the January 2016 medical journal report. The experts concluded the case is suspect for a number of reasons; they do not believe laser targeting caused the alleged injury. 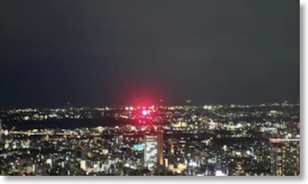 Here is a photo showing how a 1 milliwatt laser is visible at a distance of 20 kilometers (12 miles) across Tokyo. Although the laser’s irradiance is below the FAA distraction limit of 50 nanowatts per sq. cm. -- it is approximately as bright as other city lights -- you can see that the light is still visible. It is a temporary flashblindness hazard from the pointer, out to about 260 feet. On the diagram, this is illustrated in the inset photo “Near-flashblindness” which shows what a 5 mW laser looks like at 350 feet. More powerful lasers are hazardous at greater distances. The hazard distance increases as the square root of the power increase. For example, a 125 mW laser is 25 times more powerful than a 5 mW laser. The square root of 25 (the power increase) is 5 (the hazard distance increase). Therefore, multiply the hazard distances for a 5 mW laser by 5, to find the hazard distances for a 125 mW laser. For example, if a 5 mW laser is an eye hazard out to 52 feet, a 125 mW laser is an eye hazard out to 5*52 or 164 feet. We also have an online laser hazard distance calculator, and a page that explains the hazard distances in depth. If you absolutely must point something out in the night sky (e.g., at a star party), use the laser to circle the object -- don’t aim directly at it. Additional suggestions are on the Tips for star pointing page. 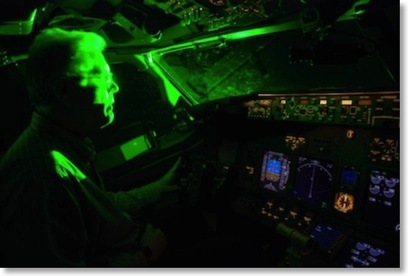 For the FAA’s viewpoint, see the 2009 FAA/Air Force aircraft laser illumination video, and the 2010 FAA publication “Laser Hazards in Navigable Airspace”, also known as “Medical Facts for Pilots” (AM-400-10/3). Studies from the FAA and others are in the “Info & studies from FAA etc...” section of this website. Articles from other aviation sources, and presentations to laser safety groups, are on the Links page. 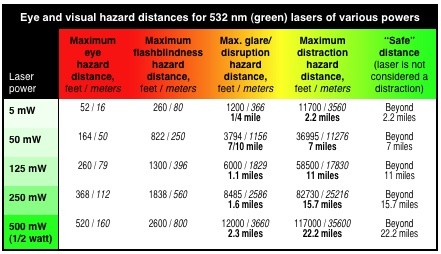 We have additional diagrams comparing the hazard distances of various lasers.